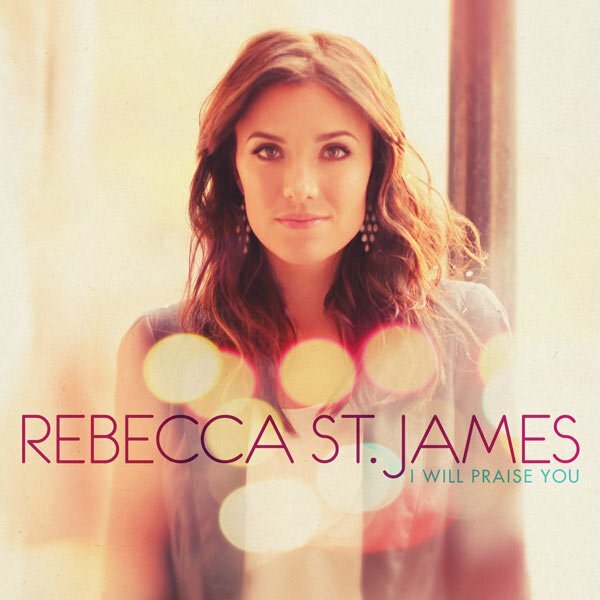 The talented Rebecca St. James returns with her latest album, 'I Will Praise You' - although quite how she manages to fit recording an album in amongst her many other gifts is another matter. Aside from singing, Rebecca is also an accomplished author and actress, and is well known for speaking out on Christian issues. Read More The talented Rebecca St. James returns with her latest album, 'I Will Praise You' - although quite how she manages to fit recording an album in amongst her many other gifts is another matter. Aside from singing, Rebecca is also an accomplished author and actress, and is well known for speaking out on Christian issues. Considering the new album is described as Rebecca's 'worship album', it was an unexpected bonus to find that opening track 'I Will Praise You' has a very current sound, along the lines of Katy Perry, with a pacey dance style rhythm to accompany the catchy chorus: "Whatever the storm, whatever is lost, whatever it takes, whatever the cost, I will praise You". CCM artists have stumbled upon what they evidently see as the 'recipe' for a 'worship album'. You get your hands on some of the most popular modern songs that churches everywhere are singing, add a new guitar riff and record them for your 'new' album. Well, that may sound a little cynical, and indeed some artists have used this as a rather lazy way to produce an album. But similarly, there have been some excellent examples of this technique. Rebecca St James takes the moderated route, recording only a couple of covers and mixing in plenty of original material. Matt Redman's 'You Never Let Go' is the first cover to get the RSJ treatment. The verses are backed by an atmospheric keyboard sound before the crashing drums and heavy weight guitars take everything up a notch for the superb chorus. It was already one of my favourite worship songs and I thoroughly enjoyed Rebecca's energetic and exciting version, backed throughout by an infectious foot-tapping drum beat. The other cover is 'Almighty God' from One Sonic Society, and again this is done brilliantly by Rebecca. Musically it's dramatic, moving and intense, equally matched by the effortless vocals which ride the waves of the song with ease, from the lows of the verse to the highs of the chorus. 'Shine Your Glory Down' is an intriguing blend of worshipful lyrics set in a contemporary sounding musical backdrop. In fact that statement pretty much sums up this album. 'In A Moment' starts as a more hushed ballad style of song, with some excellent jangling guitars and a slow building rhythm. The power of Rebecca's voice leaves you with a tingling sensation as she sings "Alleluia, Alleluia, all the earth will bow and sing". In 'The Kindness Of Our God' Rebecca's vocals take on an almost Enya style, accompanied by some Celtic sounding instrumentation and pounding drums. Every track is a viable album highlight, the stunning 'When The Stars Burn Down' deserves special note, whilst the piano and strings on closing tracks 'You Hold Me Now' and 'You Make Everything Beautiful' add a wonderful warmth. With this album, Rebecca would hold her own against any of the strong solo female artists of the modern era. There are touches of a young Madonna, and more modern influences from Dido, GaGa and Rhianna. At times you have to pinch yourself to realise you're listening to a worship album - sure the lyrics make it clear what message is being delivered - but musically it's as mainstream-friendly and relevant as any album you're likely to hear this year. A world-class album from Rebecca St. James.